Grounds maintenance personnel, local government facility managers, farm owners and rural lifestyle property owners frequently have the need to manage noxious weeds and growths in hard to reach lace like gullies, under fence lines, in tree plantations, even on roadside verges. 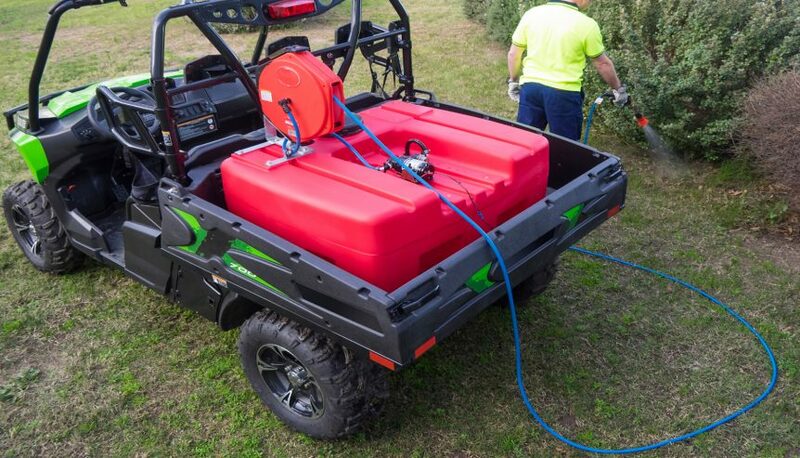 Silvan Australia has responded to this need with a new 300 litre capacity Smoothflo Squatpak spray unit combination that is compact and fully equipped with a 12-volt electric pressure pump and a choice of hose reels that will suit the user’s needs. With an atomising spray gun with a readily adjustable spray pattern the gun can apply a fine mist or a pencil stream for targeted application. The 300-litre capacity impact resistant and ultra violet stabilised Polytuff tank is fitted with an internal baffle and a drain plug that facilitates draining and cleaning after use. There is an external suction filter with a clear bowl. More importantly its compact dimensions with a footprint that is just over one metre square (actually 1050 mm in length by 580 mm in height by 1010mm in width), make it ideal to carry on a utility tray, trailer, or the body of a utility vehicle. The Polytuff tank has a dry weight of 27.5 kg. Using the vehicles twelve-volt power supply as its source the Silvan Smoothflo Squatpak features a proven Aquatec DDP 552 series pump that includes an auto bypass, a pressure sensing switch with adaptive pressure sensing mechanism, that dampen changes in pressure to eliminate pulsation. The Aquatec pump provides a seven litres per minute open flow or a 120 psi working pressure. The unit is supplied with a power cable and alligator clips for attachment to the vehicle in use. The Smoothflo Squatpak unit offers the choice of a 30-metre hand wind up or 15 metre swivelling spring retraction hose reel making it ideal for spraying from a vehicle in motion along defined areas, like driveways, plantations, beneath fence lines or roadsides. When not in use each hose reel has a locking mechanism to hold the hose secure or wound tight for travelling. With a recommended retail price of $1,439 the Silvan Smoothflo Squatpak spray unit will provide a convenient easy to use and accurate means of spray application for various site conditions.